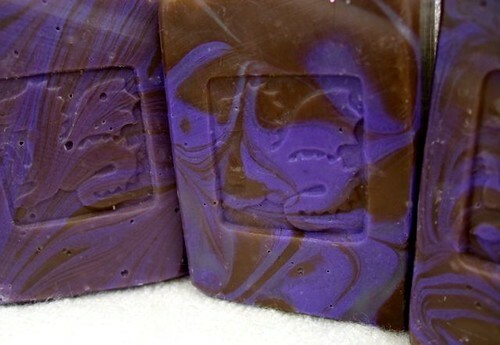 The other day, I posted about the lavender scented soap I'd made, but I didn't have any pictures yet. Tonight, I removed it from the mold and cut it into bars. I have to say that I am so so very pleased with how it's turned out. I love how it's looking right now and it smells heavenly! AND I finally have a picture of it. Cross-posted to my journal, soap, simply_soap. Though toxic waste green/yellow again, as before, it is also the best batch I have done yet? I doubled it this time, for one thing, hoping for a bigger batch once I removed it from the mold. This is also the first batch I've done that I've had my new immersible mixer from my mom for. At the end, I also added the lavender essential oil just before pouring it. Oh my! It traced beautifully. So excited. It was so thick and gloppy when I poured it into the mold and I can't wait to see how it turns out. I also lined the mold this time, first time doing so, so it will be easier to remove & cut when the soap is still soft. I hope. Cross posted to: soap, simply_soap & my personal journal. Thanks lauredhel for letting me post this here! So I just ran out of my commercial shampoo, and damned if Walmart's getting another penny of my money. Shampoo recipes plz? 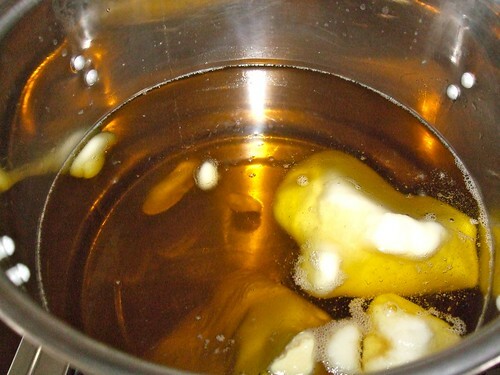 I have oily hair and lots of it, so that needs to be accounted for in the recipe, as does the fact that my soapmaking skill level is single-scent melt-and-pour. ETA: mods, can has appropriate tags? I finally got around to trimming some soap I made a fair while back. I thought I'd share a few pics. 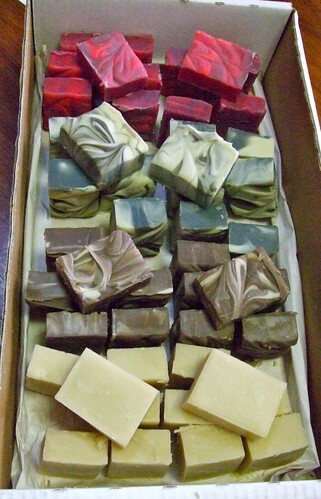 Most of these were made with Brambleberry fragrance oils (I've lifted their descriptions, all available at brambleberry.com), and all are olive-dominant vegetable soaps. I made soap! Borrowed a few drawers of spoons, had some assistance, and got it done. I seem to have streamlined/ME-friendlied my method somehow, because it worked so much better this time. Maybe I just didn't stuff anything up this time! Pink and purple neon swirl: Brambleberry "Love Spell" fragrance oil - I'm going to change this name, but I'm still working out what to call it. Fragrance description: "It has fruity sweet notes of Italian Bergamot, White Lady Peach and Strawberry mixed with middle notes of Apple Blossom, African Tamarind and a touch of Damask Rose. The base is Tonka Bean, Coconut Milk and White Musk." White and blueish swirl (swirl will discolour to bluish-brownish over time): Black Amber & Lavender, again by BB. Fragrance description: "Deep and sophisticated this fragrance blends rustic Amber with bold Parisian Lavender. Combined with these main scents is a mysterious Black Myrrh, dulcet vanilla Tonka bean, and a splash of Egyptian Musk. We've rounded out the fragrance with a surprising addition of raw Clary Sage resulting in an earthy concoction with hints of sweetness and pleasing floral notes." I love this fragrance, which is mostly a lavender-vanilla to my nose, soooo much. 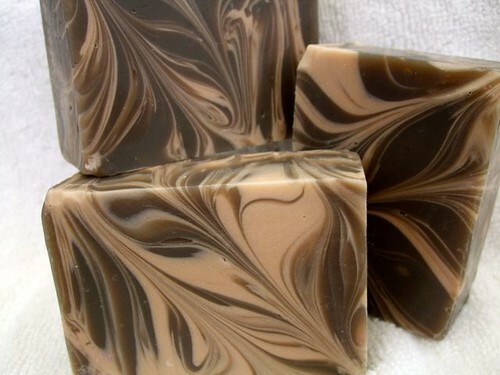 Brown with white swirl: Sweetcakes Sandalwood fragrance. A pretty straight sandalwood, to me. Fragrance description: "An excellent imitation of the very expensive real thing. A touch of real Indonesian sandalwood is accented by essential oils of cedarwood, patchouli, and amyris, supported by synthetic sandalwood aroma materials." Uncoloured soap: Brambleberry Stargazer Lily. Straight up lily. Am now planning a big batch of uncoloured castile (some with goat's milk, some not), an oatmeal-stout soap, a rose & rose geranium, and to try out new fragrance oils Honey Ale, Ancient Sedonia, and Amber. Have you been soaping lately? Planning any batches? Found any good soapsmut photos to share? 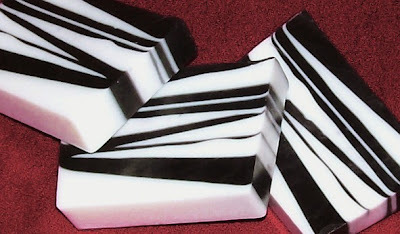 These incredible column-swirl soaps are by Sergio at Jabones: Alquimia de las plantas. The first reminds me of those fascinating cutaway pictures of the Earth's internal structure that I used to pore over as a kid. 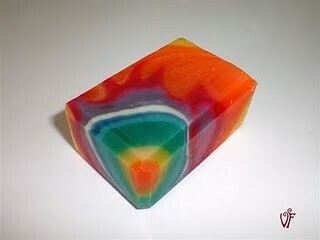 For the secrets on how this soap is made, check out Sergio's video. Others have been trying it out - Lovin Soap has a roundup. 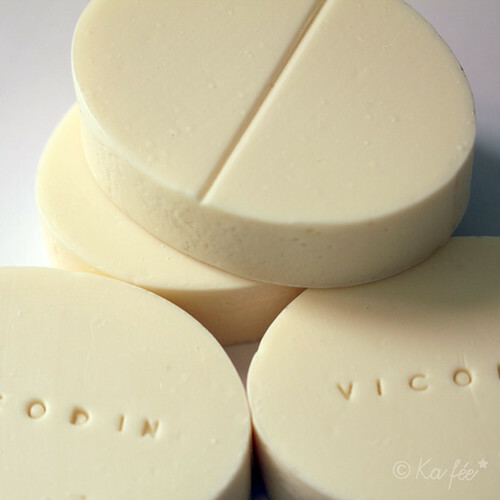 Vicodin soap by Karine Ka of Soap Session. For my chronic pain buddies! No fragrance in this one, just a little whisky. My first attempt at making cold process soap. This weekend I made my first experimental batch of soap. My main goal was to become familiar with the cold-process procedure itself using ingredients I already had before investing in more supplies with the production of decent soap as a bonus. In all, the process was a lot less intimidating than I thought it would be. I'm definitely giving it another try even if this batch doesn't set. I thought some of you might be wondering what the finishing process and the finished product looks like! 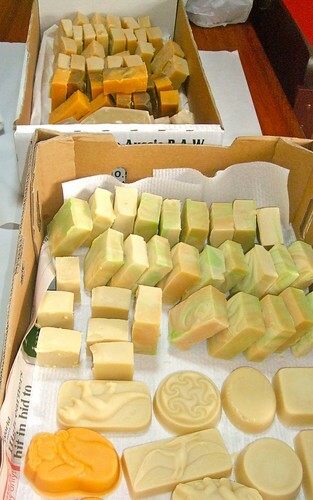 Here's a little run-through of my process from rough just-unmoulded soap to finished soap ready for labelling. This time around, I did this about a week after the soapmaking. It was cool weather, and a little humid, so this ended up being just about right. I judge the readiness of the soap by its feel - like a fairly hard cheddar cheese, just indenting on firm finger pressure, but springing straight back. This means it will be firm enough to trim and plane and stamp without smoodging and spreading, but not so hard that it will crack and crumble. 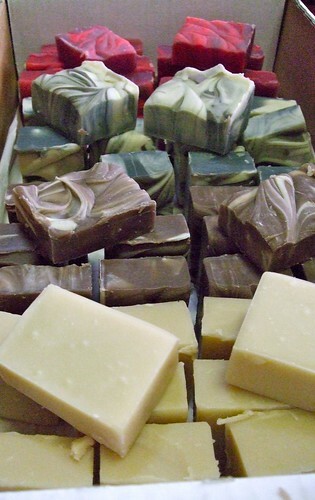 So here we are the next day, folks, just itching to get the soaps out of their moulds. Enjoy them with me! 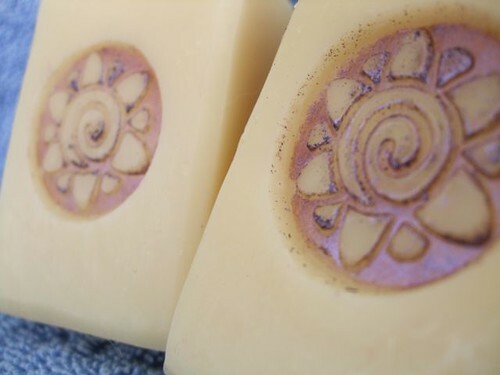 Here are the lavender & lemongrass soaps - check out all that lovely texture. A few bars came out a little soft around the edges. I think it would have been easier to unmould them if I'd left them two days. No matter: more soap for the home slushpile! Here are the neroli (orange blossom) swirlies. The delicate colours turned out exactly as I wanted them to in this batch. I'm squeeing a little at this point! Having walked through my soaping setup the other day, now it's time to tackle the nitty gritty: the soapmaking itself, from lye to moulds. This is the most spoon-sapping part for me, because everything else I can do in little pieces, over the course of a day or more. This has to be done right through (apart from a rest while the lyewater is cooling). So after having picked a week or fortnight period where I can soap in the middle and rest for a few days either side, I roll up my sleeves, glove up, and off we go. 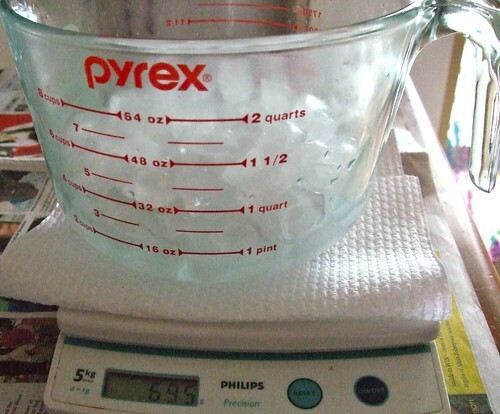 The first step is weighing out my water. I usually do around a half-half water-ice mix. On this soaping day, I did one about half-half, and one with a big more ice than water, just to see how that would go. I actually wasn't thrilled with it: the resulting lyewater did start off a bit cooler, but it was significantly more effort stirring to dissolve the lye. I think I'll stick with half-half, or even a bit waterier than that. Soap, soap, soap! It's been so long since I last made some, and the soapmaking pressure was building so that I had a real head of steam going. Yesterday I finally had the combination of an assistant present, no child in the house, and a little allocation of spoons, so away we went! Since I had my assistant there to help setup and cleanup and fetch and carry, I also put him to work doing photos for this four-part photo walkthrough series. This walkthrough is intended for general interest for non-soapmakers, just me sharing what a soapmaking week looks like and how I go about it; and as a glimpse for other soapmakers into another soapmaker's kitchen, which is something we almost never have an opportunity to do. The pictures aren't fancy - I have a point-and-shoot camera, and no lighting equipment. But they do give an insight into what soapmaking looks like in a regular kitchen, rather than in a photo studio! I'm looking for a way to make my own eco-friendly liquid soap. I'm currently looking at the first recipe on this page. It sounds easy enough, but I've never done this before. 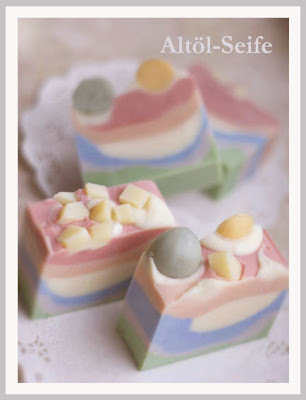 I am loving reading The Soap Bar blog! I make a big batch every so often. It's mostly for my own use, but every so often I make enough to sell the extras. Welcome to newly arriving members. Will you take a moment to drop us a line? - Do you make soap right now? If so, what kinds? what do you like? 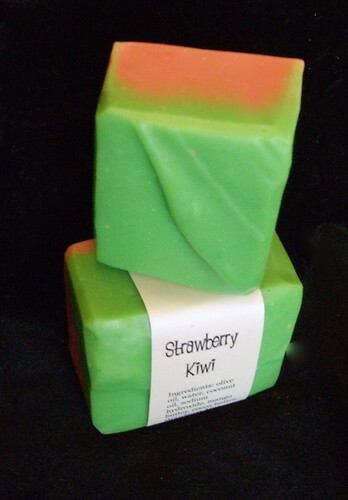 - If not, are you interested and researching, or just here for the soap pr0n? Which is fine too. This community is for soapmakers and prospective soapmakers of all persuasions - cold process, hot process, rebatch, melt and pour, whatever you love. You're welcome to ask questions, troubleshoot, or show off your creations. I'm mostly a high-olive DWCP (discounted water cold process) soapmaker, though I do a tiny bit of CPOP and the occasional bit of melt and pour. I've been soaping for five or six years now. 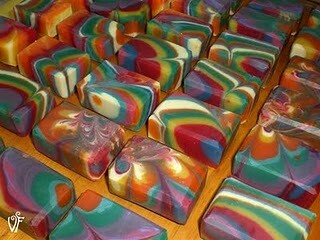 I thought I'd kick off the community just by showing you a few of my latest soaps. lauredhel - Soap! Soap! Soap! 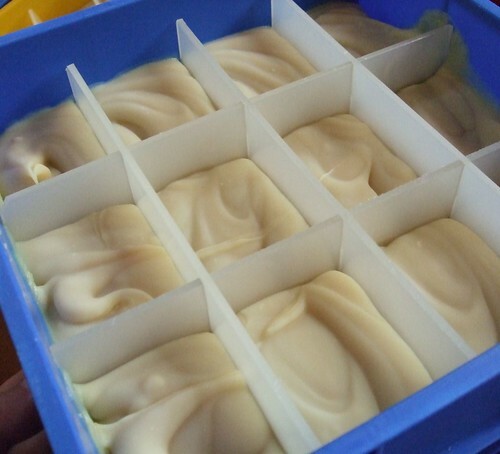 delladea - My first attempt at making cold process soap. takemyrevolution - Making liquid hand soap?